A Black nosed dog's color marker is (BB). If the dog is Black nosed and carries for Liver then it is (Bb). Liver nosed dogs are (bb) color marker. The Parti marking does not change the color marker rule, you just add Parti color marker into the rule. The purpose of this page is to share the FCI, AMSC and AKC Miniature Schnauzer coat colors for a MINIATURE Schnauzer. This page has nothing to do with coat coloring pertaining to the other two Schnauzer breeds which are the Standard Schnauzer (FCI colors are Black and Pepper/Salt) or the Giant Schnauzer (FCI colors Black and Pepper/Salt and the AKC will register a Giant in Black/Silver but it's not a breed conformation color). FCI Link for the Giant Schnauzer. FCI Link for the Standard Schnauzer. FCI Link for the MINIATURE Schnauzer. Recognized colors according to the AMSC (Black, Black/Silver and Salt/Pepper) and the non-recognized Miniature Schnauzer colors but can be registered with the AKC are (Livers, Parti's, White and Wheaten). However, the FCI recognized color chart does include WHITE and of course Black, Black/Silver and Salt/Pepper. ALL colors can fade as the result of clipping and/or genetics--there is even a gene called the "greying gene" that can impact every color including Livers. Also many colors have a maturing process from the puppy coat into the adult coat there are example pictures below. 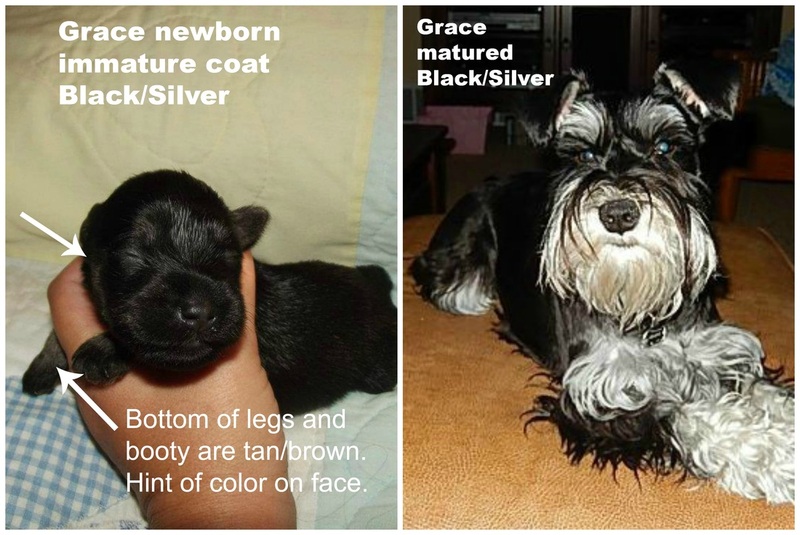 PICTURES and more information below about Miniature Schnauzer colors. I also have information for breeders below on color genetics. The three standard colors are Black, Black/Silver, and Salt/Pepper according to the parent club which is the AMSC (only recognizes those three colors). These colors are referred to as the only "recognized" colors... meaning only recognized to meet breed standard and conformation. However outside of the USA, White is also a recognized color for conformation/showing. 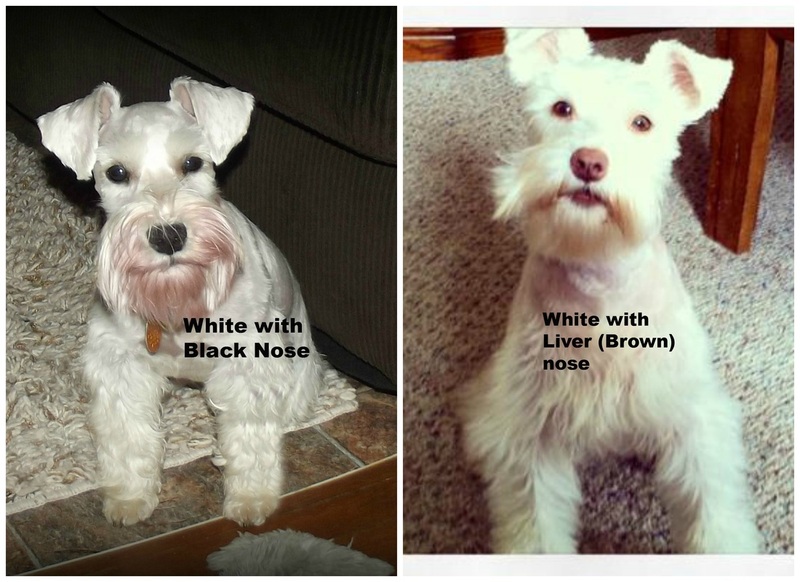 FCI recognized colors for a Miniature Schnauzer are WHITE, Black, Black/Silver and Salt/Pepper. NOTE, ﻿the AKC alternate/nonstandard colors can participate in EVERY AKC sanctioned event but Conformation. Again these colors can participate in AKC Agility, Obedience, Earth dog, etc. The alternate colors are; Liver (recessive to Black), Liver/Tan (recessive to Black/Silver), Liver/Pepper (recessive to Salt/Pepper). Then there is White with a black nose and its recessive is White with a liver nose. White is a hidden color (or masking gene). 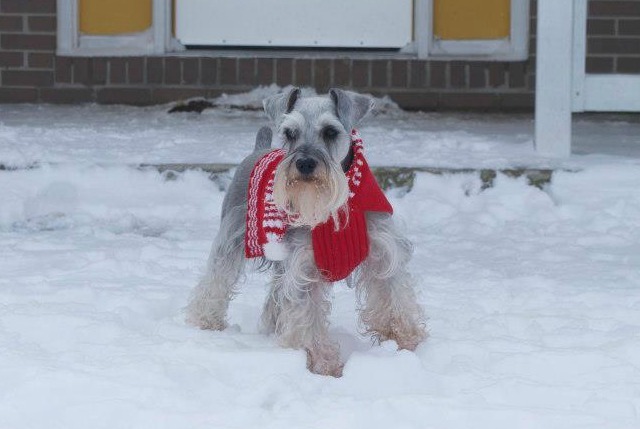 The gene that causes the White coat color actually suppresses the Schnauzers base color. For example, my White Schnauzer's masked color is Salt/Pepper. Think of it this way--you have a RED barn that you decide to paint WHITE. The White barn still has a RED barn underneath the White but you just can't see it. True Whites are born pure White. PARTI, all the recognized and non-recognized color combinations can be marked with patches of white which is a Parti pattern. Parti is a pattern of WHITE hair on a BASE COLOR. Parti means having a predominant color broken by patches of WHITE. Parti pattern means that a base color is covered in large or small patches of white. A BLACK Parti (many incorrectly label as black and white parti) is a BLACK Schnauzer with patches of White. Remember that Parti already means it has white patches so there is no need to repeat this when labeling the color classification--you just say Black Parti. Again, Black Parti means the base coat is Black (A Black Schnauzer that is marked in WHITE (PARTI), Black/Silver Parti (will have distinct WHITE eyebrows and muzzle and other distinct markings in the absence of the Parti marking covering that part of the body), Salt/Pepper Parti, Liver Parti (many incorrectly label as brown and white parti), Liver/Tan Parti, Liver/Pepper Parti, and a White Schnauzer can be masking a Parti coat too but there is NO reason to label it a White Parti (just say White since White masks a color anyway). Liver is often termed as Chocolate to make it more appealing to buyers but the AKC classifies brown as Liver for Miniature Schnauzers. Wheaten which is a more yellow/cream/red color is also registerable and can come in both a Black nose/pad pigment and Liver nose/pad pigment. "Wheaten is an old term, commonly used by terrier people and others to denote reddish, banded hair where the root is lighter and the tip is darker. Genetically, this banded hair is called “agouti” and is considered the “wild type”. Coyotes, wolves, foxes and raccoons are just a few animals that have “agouti” coloring. Agouti is the gene that makes a fox have reddish hair with black tips and a coyote to have yellowish hair with black tips. Technically, studies show that the agouti protein competes to bind on the melanocortin receptor and must sometimes win. The competition is going on as the hair is growing and which results in a hair that changes color along its length. Little (1957) suggested that agouti is the gene that causes paler colors on the underside and dark on the back." Black and it's recessive Liver... Both can fade with age and some more quickly than others... Both can be marked in white (Parti). Both can also be masked by the White gene. Black is one of the traditional Schnauzer colors AND Liver is the recessive to Black and it also can FADE... Black and Liver start out very dark in coloring, depending on grooming, age, and other colors in the pedigree it may fade quickly or it may not fade very much at all. A Black Schnauzer that fades to Silver is STILL genetically Black. Liver also fades and some Blacks and some Livers can have a darker stripe along the back and have fading that is seen when the coat is lifted. Liver's tend to have a ginger look to the undercoat when they are going to fade. NOTE: Both colors can be marked in PARTI (patches of white on a base coat color). Salt/Pepper and Liver/Pepper follow the same guidelines for coloring. Both can be marked in white (Parti). Both come in shades of very light to very dark. Both can also be masked by the White gene. Salt/Pepper is a standard conformation color and Liver/Pepper is the recessive alternate color. Peppered colors always have banded hairs peppered throughout the darker solid body. Banded means that ONE SINGLE strand of hair will have a pattern of dark and light coloring on one hair stalk. This is best seen on hand stripped dogs. Notice both peppered puppies have lighter ears than the rest of the body. As Salt/Pepper and Liver/Pepper mature the muzzle will be brighter, the leg furnishings and eyebrows will also be brighter. Both have peppering aka banded hairs. THIS IS BI-COLORED PATTERN PATTERN and both can also be marked in PARTI TOO. 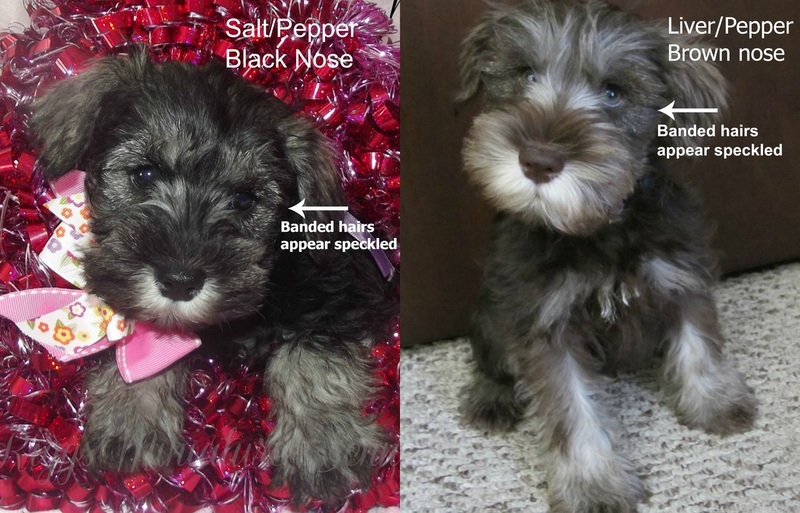 FROM THE PROFESSIONALS: Salt/Pepper - contributed by Penny Hirstein http://judgesl.com/MINSCHN/JUDGINGMINSCH.htm There are more salt/pepper miniature schnauzers than there are black or black/silver. The salt/pepper color is a combination of black and white banded hairs and solid back and solid white unbanded hairs sprinkled throughout the top (hard) coat. The banded hairs should predominate as this is what gives the salt/pepper schnauzer his distinctive coloration. All shades of salt/pepper from the very dark to the very light, are acceptable. Tan shading throughout the coat is permissible. In fact, most salt/peppers will have tan shading behind the ears and at the very back of the hind legs. The salt/pepper carries the bi-color pattern. The salt/pepper color fades out to gray or silver white in the eyebrows, whiskers, cheeks, under the throat, inside the ears, across the chest under the tail , into the leg furnishings, and inside the hind legs. Additionally, it may or may not fade out on the underbody; if it does, it must not rise higher on the sides of the body than the elbow. A black saddle on the back of a salt/pepper is acceptable; however, you must keep in mind that the salt and pepper hairs are to predominate. ANY white discoloration in the salt/pepper section of the coat is a breed disqualification. 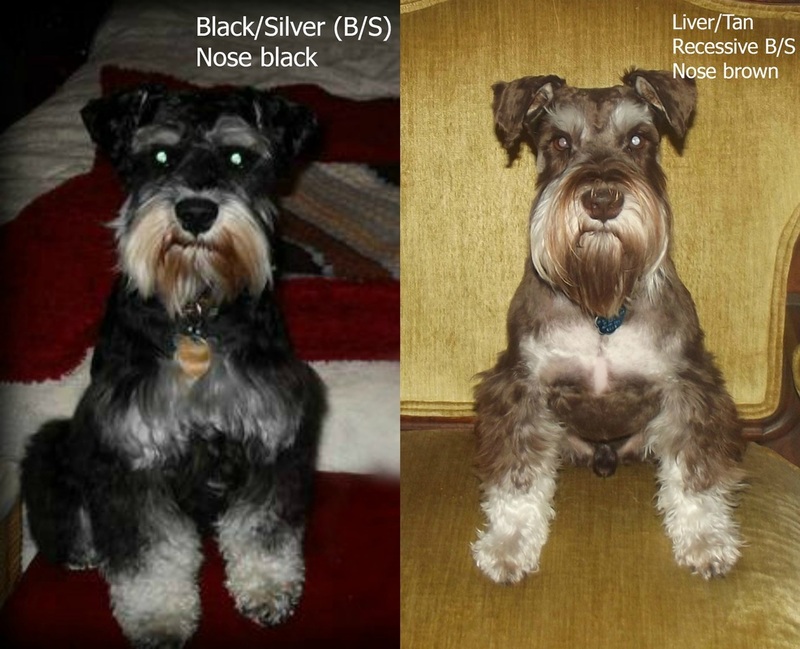 Here in America, color cross breeding is allowed and has been of benefit to the black, and the black/silver schnauzers in improving their overall conformation. It has not been as kind to the salt/pepper variation as the color crossing will tend to diminish the banded hairs. When looking at any Miniature Schnauzer, you should never be in doubt as to its color. If you have to wonder if it is a bad salt/pepper with not enough banding, or a bad black/silver because it has any color other than black in its body coat, then this dog is incorrect and should be faulted. All salt/pepper will have a dark overlay of hair in the whiskers which is called a mask. As a general rule, the darker the salt/pepper, the darker the mask will be. Some salt/peppers will have a solid mask; others will have a striped effect with dark hair under the eyes and again around the nose with white or silver gray hair in between. This mask is very important to the salt/pepper as it is a factor in achieving the proper schnauzer expression. 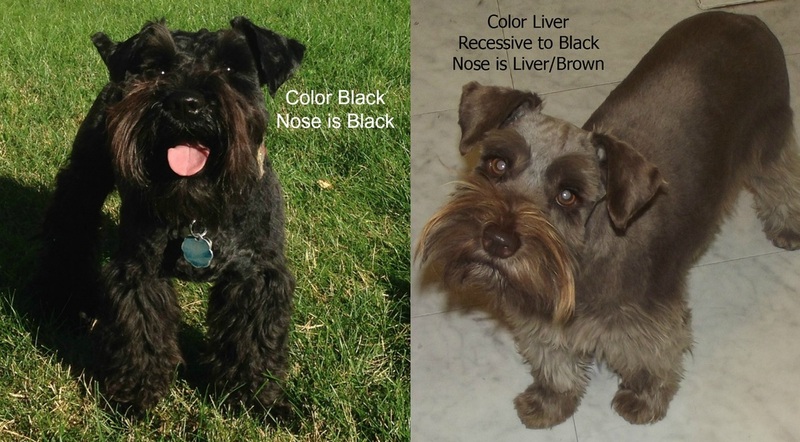 Black/Silver and its recessive Liver/Tan -- follow same guidelines for color classification. Both colors can fade ansd some more quickly than others. Both can be marked in white (Parti). Both can also be masked by the White gene. Black/Silvers recessive is Liver/Tan. Black/Silver was added as a conformation color to the AMSC after it was realized it was NOT a dark Salt/Pepper and this color breeds true. Breeding true means that if two Black/Silvers are bred the ONLY color they will produce is Black/Silver HOWEVER if both carry for Parti or Liver they may also produce Black/Silver Parti and/or Liver/Tan Parti. If two Liver/Tans breed then all they will produce is Liver/Tan (if both carry for Parti they can also produce Liver/Tan Parti). Black/Silver and Liver/Tan are both marked the same. Bright eyebrows, bright legs furnishings, and brighter muzzle once mature. Both when born may start out darker and mature into their brightness which is shown below. THIS IS BI-COLORED PATTERN. Both can also be marked in PARTI (patches of White). FROM THE PROFESSIONALS (AKC Judges): Black/Silver - http://judgesl.com/MINSCHN/JUDGINGMINSCH.htm Black and SILVER. Not black and white. This is the bi-color pattern seen in the Rottweiler, Doberman and many other breeds. Visualizing the color pattern of these breeds will give you the pattern that will be visible on an intensely colored black and silver. A well-colored b/s is indeed born black and tan, with his color clearing as he matures, but the furnishings will always minimally retain a very pale pewter or silver color. The black and SILVER will have a black undercoat as called for in the Standard. There will be a black underbelly, black running down the outside of the front legs, and black wrapping around the hock. On a young puppy, this black on the belly and in the furnishings will be very intense, on a mature dog, it will be less so, frequently turning to pewter, BUT - shades of black will always be there. The crossing of the b/s with the s/p has unfortunately resulted in the all too frequent b/s acquisition of the lighter s/p undercoat and less intense coloring. These puppies are born strikingly black and white and unfortunately, appeal very much to the uninitiated. As they mature, there will be no black evident in the front legs; undercoats are light and rear legs will not have color wrapping around the hock. In the ring, however, rarely will you see the light undercoat, as it will have been corrected. The bow tie on the chest is difficult to deal with in these instances, and will usually assume a more rectangular shape. It is strange indeed to find a b/s with an intensely black undercoat and belly, but with no color running down the front leg or around the hock. The well-colored b/s pays a tremendous price for his color as he moves away from the judge. The younger the dog, and the more intense (better) his color, the greater the price. The black wrapping around the hock, and black hair on the inside of the foot (where the big toe would be) make the dog appear to be cow hocked or pigeon-toed. The astute judge will take this into consideration. 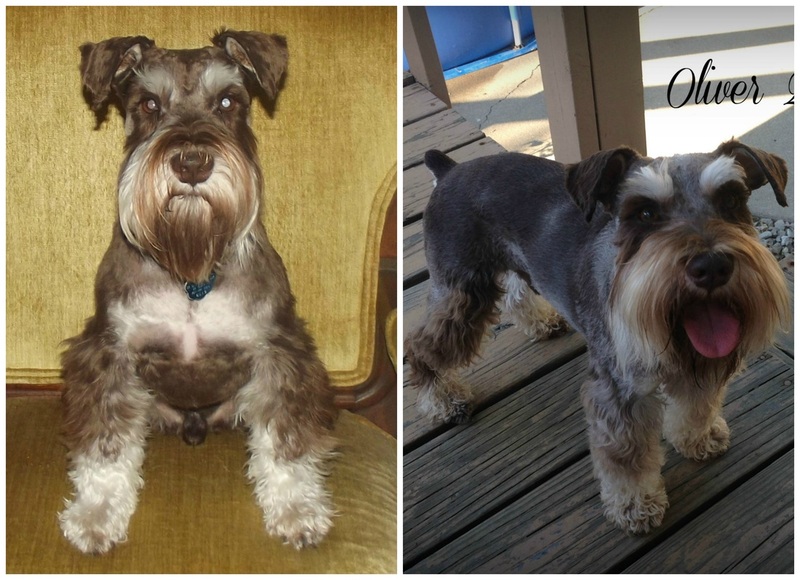 This is a BI-COLOR meaning it has a mask which is easier to see with darker coats and blends into a lighter peppered coat as the Schnauzer ages and fades. Both Salt/Pepper (S/P) and Liver/Pepper (L/P) and Salt/Pepper Parti and Liver/Pepper Parti will have banded hairs which as you can see up-close are a single strand of hair with lighter specks on the darker strand. The darker the Salt/Pepper or Liver/Pepper the more easily you can see the banding. Salt/Pepper and Liver/Pepper can be very dark looking almost like Black/Silver or Liver/Tan to very light... looking white or silver in Salt/Peppers or for Liver/Pepper. The banding is harder to see in the lighter coat and is very obvious in a darker coat. NOTE: Being grey or silver is NOT what makes a Salt/Pepper that color classification--it is the BANDED hairs that classify them as peppered. BANDING: when hairs have bands of more than one color. Associated with agouti (aw). The lighter the coat the hard it is to see the banding--you should be able to see it under a microscope if you take hairs from the sides of the lighter dog or from the face cheek area. This is another Salt/Pepper that has faded so much she looks almost White. Salt/Pepper and Liver/Pepper can be very DARK in coloring to very LIGHT. When the color is DARKER the bi-coloring and mask are very striking. Puppies maturing into coat coloring. This applies to Black/Silver, Liver/Tan, Salt/Pepper, Liver/Pepper, and their Parti colors. Many puppies are born darker and mature into their brightness. Examples below. Darker Salt/Pepper will also look like Grace below at birth but the difference between a Black/Silver and Dark Salt/Pepper is that S/P have TAN behind the ears and around the eyes eventually aka peppering. NOTE: Grace below was Black/Silver from BIRTH. Knowledgeable breeders understand the immature coat color and what to expect once the color matures! She did not become Black/Silver, she was ALWAYS Black/Silver and if she fades later she will be a FADED B/S. WHITE is NOT albino. Albinos have pink noses as adults which is a lack of pigment. Pigmented White can often look yellowish or have a yellow strip down the back. White with black eyes, nose, and feet pads is pigmented as are White with brown noses, feet pads, etc. White comes in the traditional Black nose and the recessive Liver (brown) nose. White is actually suppressing or masking the dogs coat color. So, to make this understandable the gene responsible for WHITE is a gene that suppresses an actual color such as a Black coat etc... All Whites have a masked coat color. My White's masked color is Salt/Pepper. Breeding two TRUE White Schnauzers will result in an ALL White litter. That is the ONLY genetic outcome possible. A little help for Breeders and what color combinations you will get from breeding parents of certain colors. How recessive works and color classification pet-peeves. I am going to start simple with Black, Black/Silver and Salt/Pepper that only carry for these three colors. So the first three examples DO NOT CARRY FOR ANY RECESSIVE GENES SUCH AS LIVER, PARTI or WHITE. Heterozygous (Bb) is a Black that carries for Liver (bb). Heterozygous Have one dominant (B) and one recessive (b) allele at the same locus... Liver does not have both (Bb) but (bb) and she knows that. BLACK can produce all three colors when bred to a Black/Silver or a Salt/Pepper. You may end up with all three colors, only two of three or all Black. It just depends what both parents carry for and just because it is in their pedigree does not mean they carry the gene for that color. FYI: The only way to get a Black puppy is for one of the parents must be Black. Black/Silver bred to Salt/Pepper can produce either of the two colors or just Salt/Pepper. These two colors CANNOT produce a Black puppy. Black/Silver bred to Black/Silver can only produce more Black/Silvers as it is a double recessive and breeds true when bred to another double recessive. Now let’s try and briefly cover Black, Black/Silver and Salt/Pepper that BOTH carry for White. Remember White is a masking gene that basically hides the actually color of the dog. Both parents must carry for White in order to have a White puppy. Just because White is in both sides of a pedigree does not mean that both parents actually carry the gene for White. BLACK that carries for White can produce all four colors when bred to a Black/Silver or a Salt/Pepper that also carry for White. You may end up with all four colors, only three of the colors or all Black. It just depends what both parents carry for and just because it is in their pedigree does not mean they carry the gene for that color. FYI: The only way to get a Black puppy is for one of the parents to be Black. Black/Silver bred to Salt/Pepper who both carry for White can produce either of the three colors or just Salt/Pepper. These two colors CANNOT produce a Black puppy. Black/Silver bred to Black/Silver can only produce more Black/Silvers as it is a double recessive and breeds true when bred to another double recessive. However, these two colors can produce White because the White would actually be masking the Black/Silver. White is a masking gene (hides the base color) and it could be masking Black, Salt/Pepper or Black/Silver or any of its recessives or Parti. So depending on what color is being masked will determine what colors you end up with. Breeding two TRUE Whites will always result in all White puppies. That is how recessive genes work. Example, breeding a White Schnauzer to a Salt/Pepper that carries for White can result in White pups and Salt/Pepper and whatever color is being masked by the White parent. For example, say you breed a WHITE parent to a Salt/Pepper and you end up with White pups, Salt/Pepper and Black—then you KNOW that the color being masked by the White gene is Black. Remember it takes Black to produce Black. White can be masking a Black dog. Now let’s try and briefly cover Black, Black/Silver and Salt/Pepper that BOTH carry for PARTI. Remember Parti is a WHITE MARKING gene that basically marks part of the body in a White random pattern. Both parents must carry for Parti in order to have a Parti puppy. Just because Parti is in both sides of a pedigree does not mean that both parents actually carry the gene for Parti. BLACK that carries for Parti can produce all three colors with no party pattern and combinations of pups with the three Parti patterns when bred to a Black/Silver or a Salt/Pepper that also carry for Parti. You may end up with solid colors and Parti colors. It just depends what both parents carry for and just because it is in their pedigree does not mean they carry the gene for that color. FYI: The only way to get a Black puppy is for one of the parents to be Black and this applies to a Black parti as well. Black/Silver bred to Salt/Pepper who both carry for Parti can produce either of the two colors with or without the Parti pattern or a combination. These two colors CANNOT produce a Black puppy or a Black Parti. 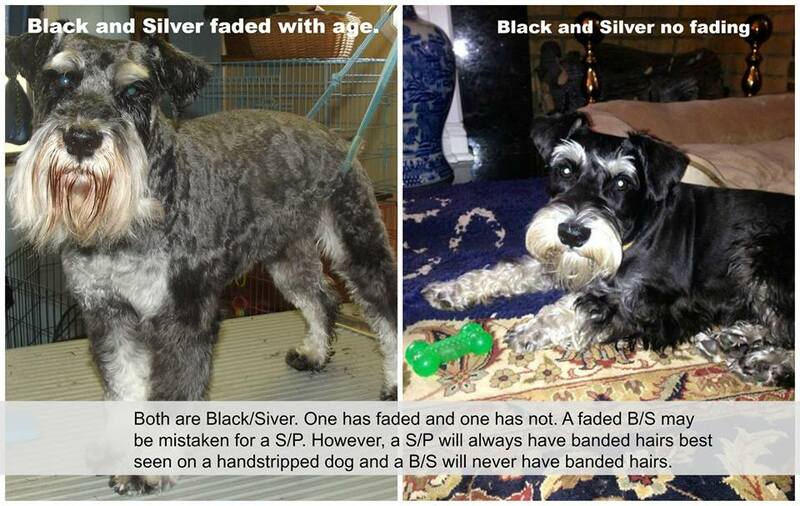 Black/Silver bred to Black/Silver who both carry for Parti can only produce more Black/Silvers and Black/Silver Partis as it is a double recessive and breeds true when bred to another double recessive. Remember that a Black/Silver Parti is actually a Black/Silver marked with the Parti pattern. Parti is a gene that randomly marks or masks part of the base color. So depending on what color is being masked will determine what colors you end up with. Breeding two Partis will result in all Parti pups. Same color rules apply though just add Parti to it. Example, breeding a Salt/Pepper Parti to a Black/Silver Parti will only result in Black/Silver Parti pups and Salt/Pepper Parti pups or one of the two colors. You cannot get a Black Parti from breeding a Salt/Pepper Parti to a Black/Silver Parti. The base color of one parent MUST be Black to get Black or a Black Parti (Solid Liver is the same as solid Black with this rule). Now let’s try and briefly cover Black (recessive is Liver), Black/Silver (recessive is Liver/Tan) and Salt/Pepper (recessive is Liver/Pepper) that BOTH carry for Liver aka Chocolate. Remember Liver is a recessive dilution gene that dilutes all black pigment to shades of brown/reds/creams. Both parents must carry for Liver in order to have a Liver puppy. Just because Liver is in both sides of a pedigree does not mean that both parents actually carry the gene for Liver. TWO LIVER COLORS BRED WILL ALWAYS ONLY BE ABLE TO PRODUCE MORE LIVER COLORS. You CANNOT get a non-recessive color such as Black from TWO parents that are Livers. Doesn’t matter if they are Liver Parti, Liver/Tan, Liver/Pepper Parti etc—they can only produce more recessive Liver genes. If someone claims they have a Black puppy from two Liver colored parents--they are either lying or totally unaware that another dog bred the female as well. 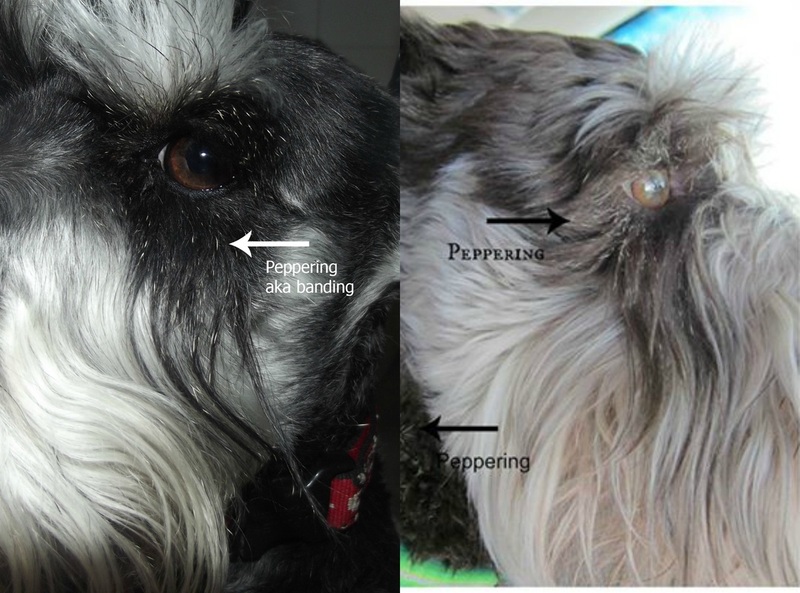 A parent such as Black/Silver can produce a Liver/Pepper pup with a Salt/Pepper parent if BOTH carry for the Liver gene. Two non-Livers can produce a Liver pup if both carry for the recessive liver gene. You are likely to get at least one Liver colored pup every time when breeding Liver carriers that are not Liver colored. A Black/Silver bred to a Liver/Pepper and both carry for Liver can produce Salt/Pepper, Liver/Pepper, Black/Silver and Liver/Tan. Remember that Black/Silver’s recessive gene is Liver/Tan. 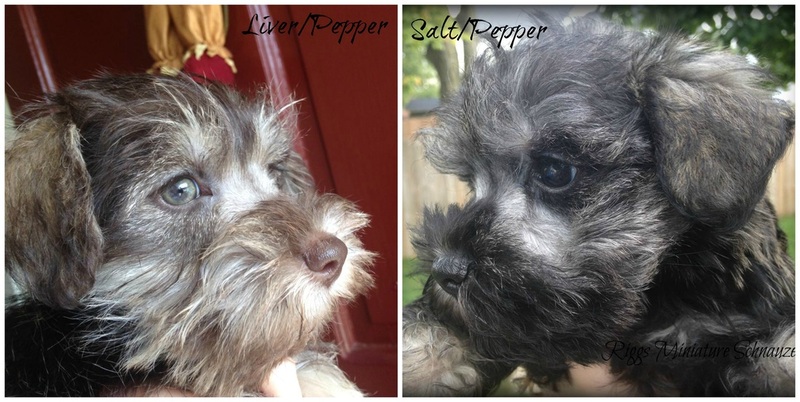 Salt/Pepper’s recessive gene is Liver/Pepper. BUT you CANNOT get Black or Liver from these two color combinations unless one of the parents is Black or its recessive Liver. A Salt/Pepper bred to a Liver can produce Black and/or Liver since Liver defaults to Black as it is the recessive to Black. COLOR PET-PEEVES! Color classification pet-peeves… You do NOT call a Black Parti, a Black and White Parti! You just say Black Parti--Parti already means partially covered in White. There is no such thing as a Liver/Pepper Tan—that is like saying Salt/Pepper Silver… A bright faced Liver/Pepper is no different than a bright faced Salt/Pepper. You certainly would not add Silver to describe a bright faced Salt/Pepper so do NOT do that when describing a bright faced Liver/Pepper. White Parti, again there is NO point in even saying this since White masks (hides) all colors/markings which means that you just classify the dog as White and if you feel the need to explain that it is masking a Parti marking and specifically what color Parti, then just say this is a White dog that is masking a Black Parti. ALL WHITE colored dogs are masking a base genetic color and/or marking. Lastly if you have two dogs that both carry for White, Parti, Liver and the standard colors then you still apply the same genetic color marker RULES defaulting back to the three standard colors along with how recessive genes work. You can also end up with quite a combination of colors. Example let's say we breed a White dog that is masking for Black to a Black/Silver Parti... Well if both carry for White, Parti and Liver then you will get White pups or pup. If both carry for Parti then you will get Parti in Black/Silver, possibly Liver/Tan Parti as well, Black Parti since the White parent is masking for Black, Liver Parti since Liver is the recessive to Black, Salt/Pepper, Salt/Pepper Parti, Liver/Pepper and Liver/Pepper parti etc... Learn your color genetics and it helps you to better know what to expect when breeding and if someone is not being honest too. ** BLACK BB (its recessive Liver bb). Can also both be marked in Parti or be masked by the White gene. ** Black/Silver (its recessive Liver/Tan). Can also both be marked in Parti or be masked by the White gene. ** Salt/Pepper (its recessive Liver/Pepper). Can also both be marked in Parti or be masked by the White gene. ** Wheaten is a gene that reddens, yellows or makes the entire coat look cream--was originally called gelb-- comes with a black or brown nose just like White. A Liver (bb) bred to Liver (bb) can only produce more Liver colors (bb). See the chart regarding TWO (bb) Liver parents. Each parent has TWO color markers. To keep this simple for Liver (bb is the color marker) and each parent passes ONE (b) of their TWO (bb) color markers to each pup. The ONLY option for TWO Liver parents reagrdless if they are Liver Parti or Liver/Tan or Liver/Pepper or White with a Liver nose is to pass on a (b) and a (b) each. If someone tells you that their two Livers (true Livers have BROWN noses, pads of feet and skin pigment--the NOSE is what you look at) produced a Black nosed pup--they are not being honeest about one of the real parents or they are clueless that their dog was bred by two different males (not to mention clueless about color genetics). Each parent passes on ONE (b) of their TWO (bb) color markers to equal two markers for each offspring. So Liver (bb) bred to Liver (bb) can only produce more Liver (bb). Of course it is a bit more complicated than just (bb) when you start adding in White, Parti, Liver/Pepper etc but regardless the base color passed is always LIVER. The RED DOT indicates a carrier of Liver which is a recessive gene in ANY dog breed that carries for it. Not all breeds carry for Liver to my knowledge. ​* A Liver (bb color marker ) aka (Red, Brown, Chocolate) dog of any breed is labeled (bb) for this example. * A Black non-carrier of Liver is (BB color marker). 1.) Two Black (BB) non-carriers of Liver bred together won't ever produce anything but Black (BB). They do NOT have a (b) marker of liver to pass down. 2.) A Black non-carrier of Liver (BB) bred to a Black carrier of Liver (Bb) will produce all Black pups but some will be Black (BB) non-carriers of Liver and some will be Black (Bb) carriers of Liver but NO pups will be Liver (bb). 3.) A Black carrier of Liver (Bb) bred to another Black carrier of Liver (Bb) will get at least one Liver (bb) in a litter or more and other Black (Bb) carriers of Liver and they can even produce Black (BB) non-carriers of Liver. 4.) A Black non-carrier (BB) bred to a Liver (bb) will produce only Black carriers (Bb) but no actual Livers (bb). Each parent passes down a marker so if the marker is not there to be passed then you can't get that color marker. 5.) A Black carrier for Liver (Bb) bred to a Liver (bb) will get Black carriers of Liver (Bb) and Livers (bb). 6.) AGAIN LIVER (bb) BRED TO LIVER (bb) WILL ALWAYS BE LIVER (bb). Two markers from EACH PARENT are always passed on whether it's BB, Bb or bb depending on what the parents have to pass forward. They are only passed based on what the parents markers are... So it's impossible for TWO Livers marked (bb) to pass on anything but Liver (bb)! You cannot breed any two Liver colors and get a Black nosed pup, period--it is not genetically possible with a recessive. When registering your puppy with AKC it is necessary to include two photos along with your puppy's AKC registration paper work. The photos must be a full front view as well as a side view of the puppy. The colors are Liver/Tan and Liver/Pepper, all Parti colors and Wheaton must include photos with the AKC paper work. You will also need to be sure to label the back of each photo with the litter registration number, date of birth and name you are registering the puppy in. AKC COLOR CODES: Some colors can only be registered via special services. the Miniature was developed in the 1800s. Interbreeding with Poodle, Miniature Pinscher, Affenpinscher and others was used to scale down Schnauzer size. This inadvertently brought new color genes into our Mini version that didn’t exist in Schnauzers previously. Here we are talking primarily about the genes behind the Liver or Chocolate Schnauzer and the Parti colored Schnauzer. So purists have historically rejected these “outlaw” Miniature Schnauzer colors so that they are disbarred from competing in the Show Dog arena. Such color prejudice led to culling of these colors from breeding stock which makes them relatively rare today. However, dogs displaying these colors can still be registered as purebred AKC Mini-Schnauzer stock and their popularity with pet owners is nurturing a revival in their numbers. 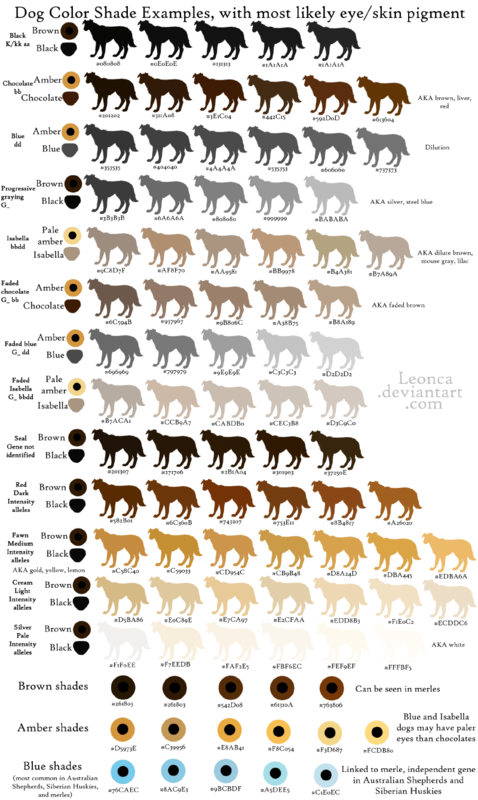 To compound their rarity, the gene that codes for brown based coloring is recessive to the black based coloring. That means both parents must carry and pass this gene to their puppies to get this coloring. Miniature Schnauzers can be either black based (with black skin, nose, pads and hair pigment) or brown based (with brown skin, nose, pads and hair pigment). Given the many breeds that were used to down-size the Standard Schnauzer to produce the first Miniatures, it’s not surprising that “non-official” colors have appeared in the breed. Indeed, varying shades of Liver or Chocolate were prominent in the early days of the breed. At least one dog from the first litter recorded in the Miniature Schnauzer studbook was “gelb” – German for yellow – i.e. a brown based dog with pale pigment deposition. “Parti” colors too, commonly cropped up in these early litters, and were also recorded from a pair of black dogs belonging to the Abbagamba Kennel in Germany in 1929, and again from a mating of two Pepper and Salt dogs in the USA. So, while they can’t compete in the Show Ring, there is nothing wrong with the other colors as many like to argue. They are 100% purebred Schnauzer, and can be duly registered (AKC). Further, the Parti and other colors are extremely "old blood", found in most of the early lines.